Golden Rule Mine (Glass), 2016. Acrylic on panel. 12 x 16 in. 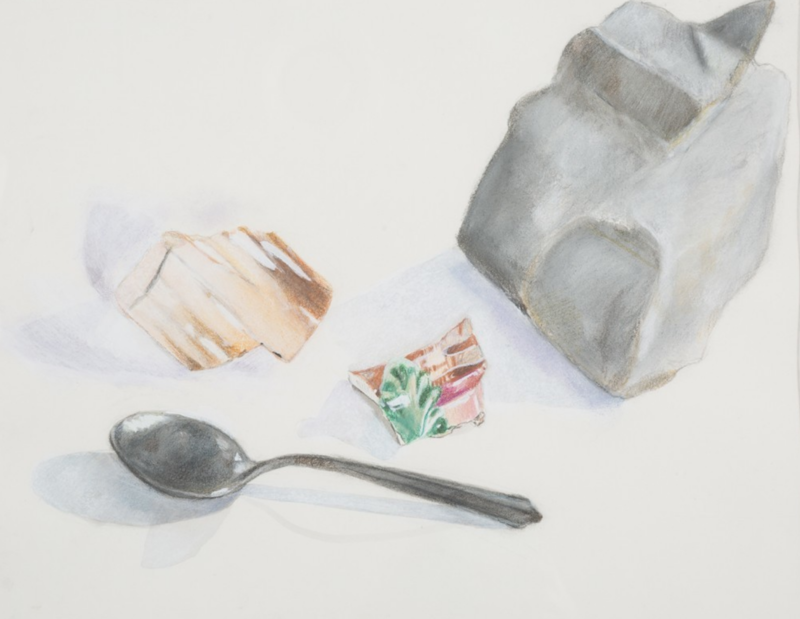 AMY BABINEC's (@amybabinec) drawings, paintings and plaster casts are driven by the recovery of memory. Informed by her educational background in Archeology, she emphasizes the fragment and the excavated object as poetic stand-ins for all that is lost. Amy earned her BFA in Painting and Drawing at School of the Art Institute of Chicago and her MFA in Visual Art from University of Chicago. Her solo exhibitions include Remnants (2015) at Moraine Valley Community College in Palos Hills, Illinois and Underlayer (2012) at Morton College Gallery in Cicero, Illinois. Amy's upcoming solo show Golden Rule opens at Riverside Arts Center’s FlexSpace (Riverside, Illinois) on June 2, 2018 and runs through July 7, 2018. The opening reception is on Sunday, June 3 from 3-6 pm. Amy lives and works in Evanston, Illinois. OtherPeoplesPixels: Generally speaking, how do fragments relate to the whole in your work? Amy Babinec: My work uses fragmentation as a metaphor for memory and the failure of memory. So many of my memories are fragmentary, particularly of my childhood. Images such as a wallpaper pattern, a book cover, and the smooth texture of a rock, conjure up a host of memories of my family, and a reminder of their loss over the years. Objects isolated from their environments can become artifacts, evidence and mementos. Subtracting context leaves the object open to fantasy and speculation. These fragments embody the nostalgia and longing I have for family relationships for those who have passed on. The objects become substitutes for keepsakes and stories from my own family. Reenactment 14, 2009. Oil on canvas. 24 x 18 inches. OPP: In your 2017 artist statement, you say,"By combining elements of archaeology, personal history, and fiction, I set up an opposition between abstraction and figuration, past and present.” And I see this very much in the series Reenactment (2009-2010). Can you talk about this body of work in relation to this statement? AB: I created the Reenactment paintings in graduate school at the University of Chicago. As an instructor of a beginning painting class, I found stacks of paintings that college students had discarded after the class ended. Many of the paintings were abstract, thus presenting an opportunity to use them as a free-association prompt. I selected and cropped the abandoned student paintings that had compositions, spatial relationships, or colors that reminded me of a place, person, or situation from my early life in Belleville, Illinois, the town in southern Illinois where I grew up. For example, a vivid orange geometric abstractioncould be turned into the orange brick cul-de-sac behind my elementary school. I intervened in the paintings with the minimum I needed to do in order to visualize that memory. 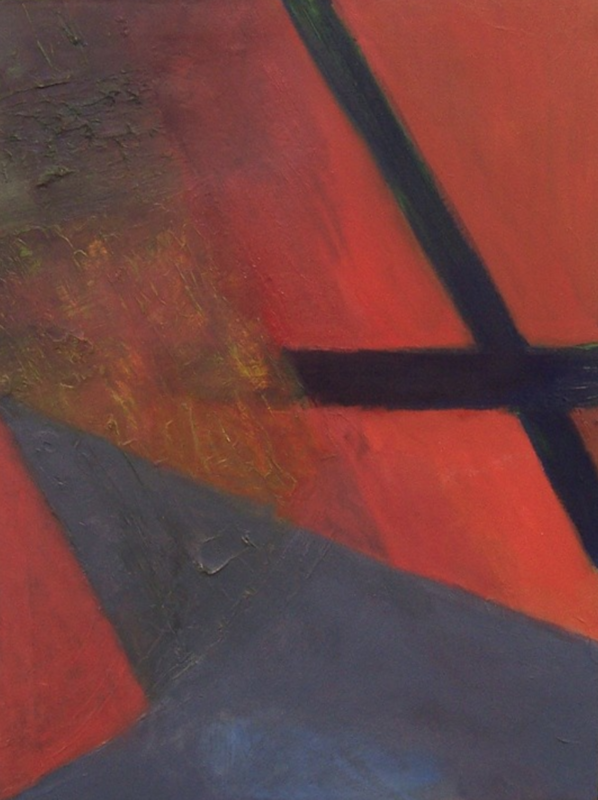 The resulting paintings remain abstractions, but with my memories (the figuration) embedded within it. Wildwood Mine, 2015. 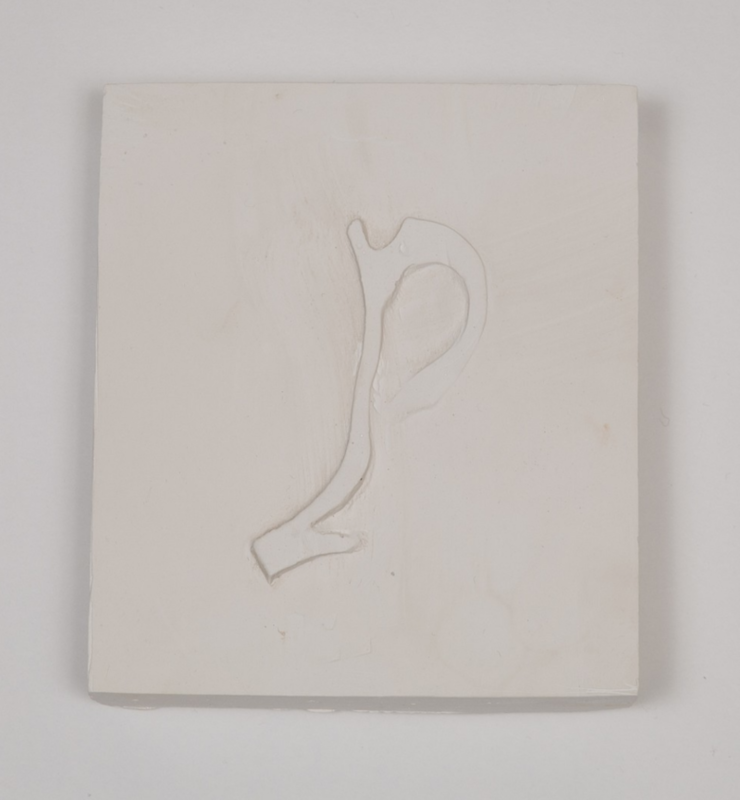 Plaster, 4 15/16 x 4 5/16 x 3/4 inches. OPP: When did you first start making work based on artifacts found in abandoned coal mines? AB: I started my research into this topic in 2009 when my parents discovered cracks in their basement foundation in their house in southern Illinois. The cracks were caused by subsidence, or the collapse of coal mines under the surface. Unfortunately, the area under their house, and most of the town, was undercut by underground coal mines which had been operated by individual owners or small companies from the late 1800s to the 1950s. Buildings and roads on the surface could prove unstable because of hidden processes under the earth and could cave in at any time. I was struck by the metaphorical possibilities of that phenomenon, that events in the past could affect the present, sometimes suddenly and drastically. I used Illinois State Geological Survey maps, Google Earth maps and historical records, and triangulated the location of mines, then drove out to find them. These sites were largely on private land. Many had been completely erased from the surface, but some had pits, coal and slag piles, railroad tracks, and other evidence of the coal industry. I discovered that many of the abandoned mines had been used as a trash dump for domestic items such as plates and cups from the 1880s to the 1960s. As part of my studio practice, I visit the abandoned mine sites throughout the year, conduct surveys and digs and bring artifacts and documentation back to my studio in Evanston, Illinois. Hill Mine Grid 3, 2013. Acrylic. 30 x 30 inches. OPP: You work in a variety of drawing and painting media, as well as cast plaster. 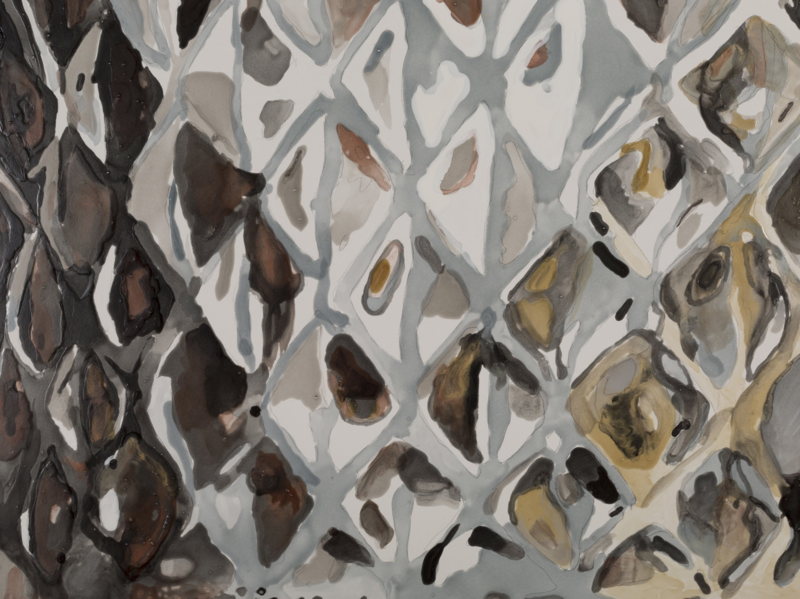 How do you make choices about which fragments should be painted in watercolor or oil versus cast in plaster? Does the object dictate this? AB: I am a materials and techniques nerd. I enjoy the process of experimentation (most of the time!) to find the technique that fits the idea. In the Subsidence project, I have used a variety of materials to interpret the data I have found. I document the mine sites through drawings, video, and photography, and collect personally resonant objects to bring back to my studio. My focus on particular facets of this process leads to the media that will reflect my investigation. Abandoned, Golden Rule Mine, Lenzburg, Illinois, 2017. Watercolor, colored pencil, and charcoal on paper. 11 1/4 x 15 inches. 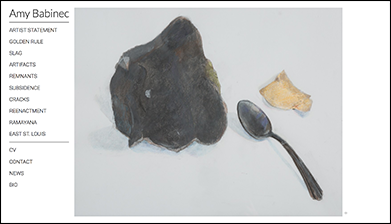 OPP: In both Golden Rule and Remnants, the found objects are isolated from their original context in backgrounds of (almost) black or white. Is this an erasure of the sites that inspire your work? Why or why not? AB: My background includes a masters degree in Art History and Archaeology at the University of Maryland and twenty years’ experience as a museum professional. I use archaeology as a touchstone throughout much of my work. The white background evokes the practice of archaeological illustration of objects uncovered at a dig, and the photographic documentation of objects in a museum. I also use the square format as a reference to an archeologist’s grid. I often show objects in a meditative, quiet manner echoing the precision of archaeological drawings. I repeat certain objects, such as a spoon, to provide a sense of scale, following the archaeological practice of including a ruler or penny in photographs of finds. Unlike an archaeologist, I am selective about what I collect at a site and represent in my work. Recently I have been most drawn to domestic artifacts dating from my grandparents’ generation in the early to mid-twentieth century. For example, a small triangle of colorful glazed ceramic, which had been broken off from a figurine of a house, takes on further resonance for me. I feel the pathos of this object, once highly valued by someone, but now abandoned by its owner to be buried in the dirt and be subjected to the elements. To see more of Amy's work, please visit amybabinec.com. Featured Artist Interviews are conducted by Chicago-based artist Stacia Yeapanis. When she’s not writing for OPP, Stacia explores the relationship between repetition, desire and impermanence in cross-stitch embroideries, remix video, collage and impermanent installations. She is an Adjunct Assistant Professor in the Department of Fiber and Material Studies at The School of the Art Institute of Chicago, where received her MFA in 2006 Stacia was a 2011-2012 Artist-in-Residence at BOLT in Chicago. 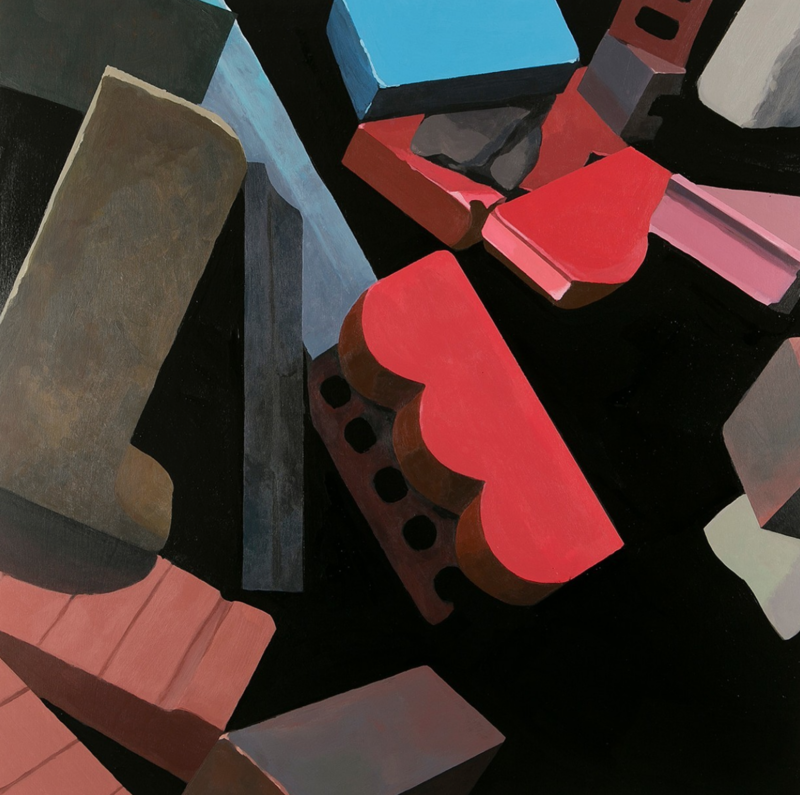 Her solo exhibitions include shows at Siena Heights University (Michigan 2013), Heaven Gallery (Chicago 2014), the Annex Gallery at Lillstreet Art Center (Chicago 2014), The Stolbun Collection (Chicago 2017) and Indianapolis Art Center (Indiana 2017). Her most recent installation Where Do We Go From Here? just closed at Robert F. DeCaprio Art Gallery (Palos Hills, Illinois). In conjunction with this improvised installation, Stacia invited eight OPP artists—Kathryn Trumbull Fimreite, Brent Fogt, Melinda Thorpe Gordon, Jaclyn Jacunski, Jenny Kendler, Meg Leary, Geoffry Smalley and Erin Washington—to respond to the text "Where Do We Go From Here?" Each artist approached the question from a different angle, emphasizing that both the We and the Here are not the same for each of us. For Chicago Artist Coalition's annual benefit Work in Progress, Stacia will create a one-night installation that solicits the help of benefit attendees.